by CompareHero.my, on category "Retirement"
Ongoing arguments about the rising cost of living, stagnant wage growth, unhealthy levels of debt per household, and unemployment issues continue to heat Malaysians up on daily basis. However, it seems that we are still not shaken by the fact that the majority of Malaysians are not financially prepared to survive once our main income source is crippled by various reasons such as a sudden job termination, retirement, permanent disability, and more. It isn’t a matter to take lightly. Many Malaysians are suffering on a day-to-day basis whether they have any retirement savings to lean on, or not. 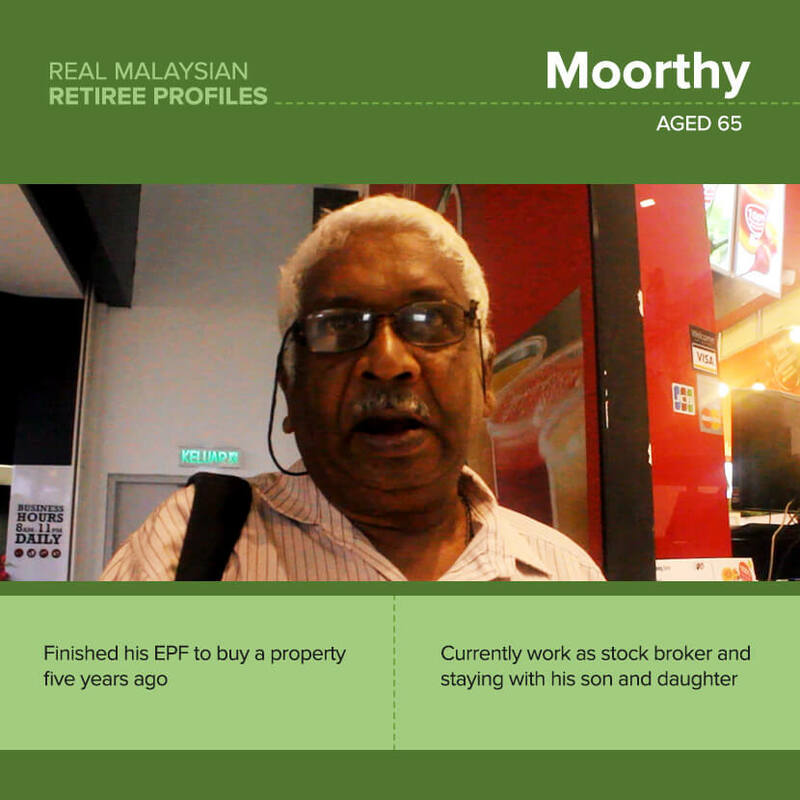 Moorthy, who used to work in the private sector, had used all of his EPF retirement savings to buy a property when he retired at the age of 55. Ten years on, at the age of 65, he is living with his son and daughter who are supporting and taking care of him. “Back then, I bought a property to stay with my family but my daughter had a problem dealing with her own finances, so we had to liquidate my asset,” – Moorthy. Now with all his retirement savings utilized and the property gone, Moorthy has returned to the workforce as an investment broker to sustain his living expenses and stay with his children. According to HSBC Bank Malaysia’s latest survey report on retirement, life expectancy in Malaysia has grown, with the average male living until age 72 and female to age 77. That could mean another 17 years living in retirement, should a man or woman retire at age 55. “Working age Malaysians may desire to retire at 55, but it may be unrealistic given increasing life expectancy and the need to fund a longer period living in retirement,” – Retirement Realities Report, HSBC Bank Malaysia. Between 2012 and 2014, the share of household income from property and investment grew from 9.7% to 11.4%. This shows that Malaysians are increasingly depending on property investment for income placement. “The ability to provide a significant financial legacy is hampered by economic factors, such as the need for parents to help their children own a home. 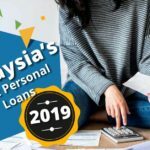 Given the current Malaysian property prices, fresh graduates or young working adults may not be able to afford to buy their own home,” HSBC’s report pointed out. With the surging property prices in main cities, parents are likely to step in to help fund their children’s home purchase, often using their retirement funds or EPF savings, which may lead to insufficient funds to see them through old age later. Case in point, Moorthy’s eye-opening story. 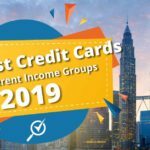 Moorthy represents many Malaysians within the M40 income bracket, banking on their property as an ideal investment alternative given the appreciation in property prices over the past four years before the market went frigid. But this also sheds light that as children, we too have to uphold our responsibilities and aim to become as financially independent as possible. Our parents will naturally want to rescue us from any bad situation and save the day, but should they forego all their hard-earned EPF savings to do so? With all respect to the fact that parents will always have the instinct to help out their children, it is time for the rest of us to be more independent and polish our financial skills as solid as possible. It is somewhat frightening to find out that many young adults and fresh graduates are still relying on their parents financially, including paying for their down payment on property and cars, to pursue their lavish lifestyle, and also help to start their own business. With that being said, we should be taking care of our parents and elders instead of the other way around. Take the first step to invest from a young age. However, remember that there are risks in all forms of investments and the best way to protect our portfolio is by diversification. Don’t put all your eggs in one basket. Adjust your lifestyle and cut down on your lavish spending like avoiding bad habits that may cause you to waste money. Be transparent with your family about your retirement savings. Haris, 57 years old, is currently a full-time activist after he retired from his job as an owner of a law firm and a lawyer himself for about 20 years. 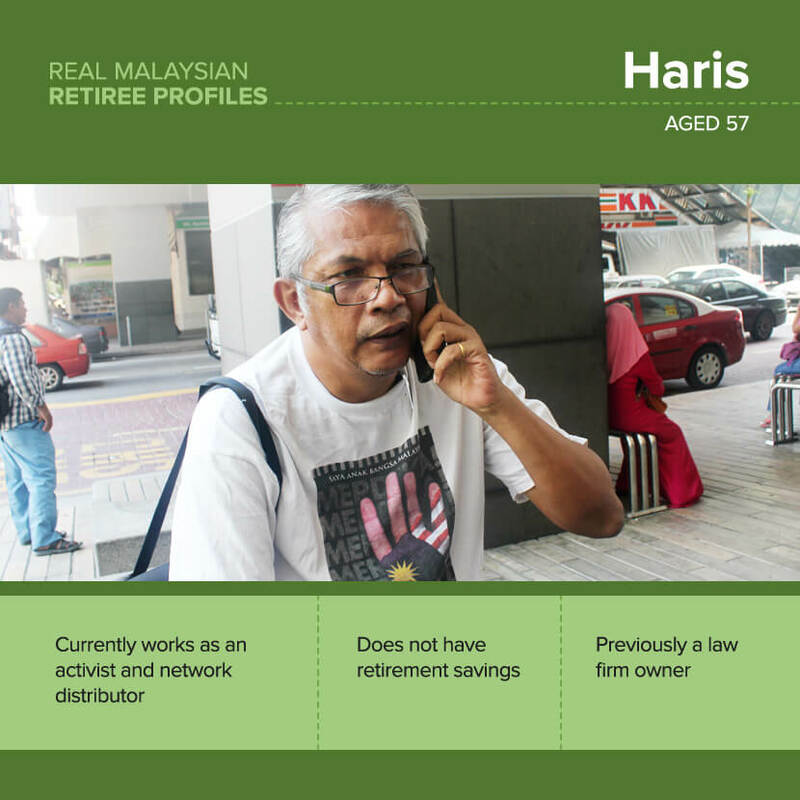 Haris does not have any EPF savings as he is self-employed. This comes as no surprise as the number of active EPF members consists of less than half of the total Malaysian workforce (48.5% in 2015). However, he manages his own savings and is currently still working as a network distributor. Though he doesn’t have EPF retirement savings, don’t be fooled into thinking he has his finances under control. Haris still has a high level of commitments that he needs to ensure he can service every month. For his own personal expenses, Haris needs to spend about RM6,000 for living expenses, loans payment, and other utility costs. Adding his dependents, he is spending approximately RM8,500 every month. With his life expectancy at 77.2 years old, Haris needs to make sure he can earn enough to maintain his lifestyle and support his dependents throughout the 20 years. 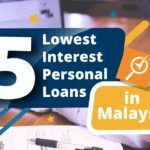 “Many senior citizens are in a troubled position today with the lack of savings and this will continue to worsen in the future as the awareness and urgency towards having retirement savings are still at a low despite the alarmingly low level of savings Malaysians have,” Haris pointed out. However, Haris admits that most of his savings were channeled towards his activist role, without allocating any more towards his own savings and investment. “By the time you get your pension, the value of ringgit is depreciating and that makes the actual spending power of a retiree much weaker than expected,” – Haris. Regardless of the income level, many Malaysians continue to overestimate their parents’ financial position. As noted by HSBC in its latest findings, 67% of today’s retirees continue to fund their children, higher than the global average of 30%. While Haris continues to support his dependents with his active income, his high expenses mean he’ll need to consider alternative sources of income to sustain the same level of income once he retires. 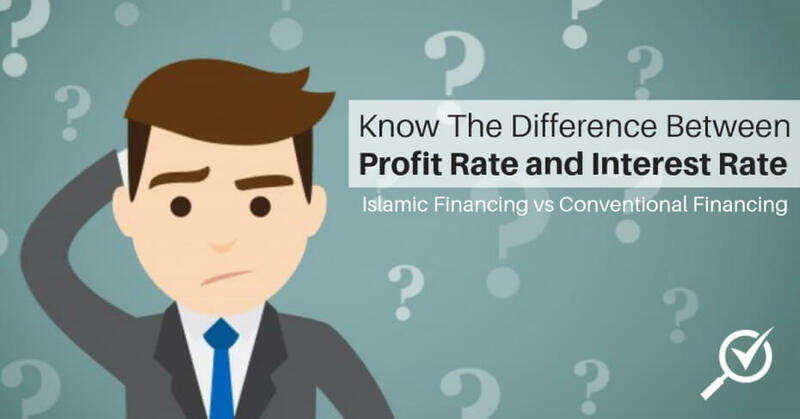 With 33% of retirees from HSBC’s survey agreeing that living expenses will be the same or even greater than it used to be, this puts Haris, as well as all Malaysians, at the risk of losing their savings faster than expected due to inflation. 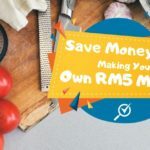 Looking at average Malaysians who are self-employed, there are still a number of people who believe that they have enough savings to deal with their retirement but then may face complications later in life due to underestimation of economic risks. Those with a high level of monthly expenses like Haris, will find it more difficult to recover from a financial crisis given the lack of secondary income. 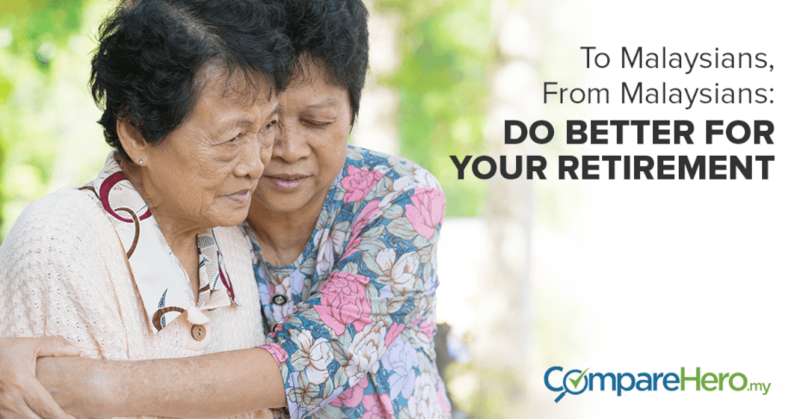 If there is only one breadwinner in the family, things get increasingly difficult during the retirement years for you and your dependents (should this be the case you are in upon retirement). 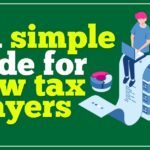 Allocate at least 15% to 20% of your current income for retirement savings, whether you are employed in public, private sector or self-employed. Mrs. Cheng, a housewife aged 74 with four daughters, is currently living with her youngest daughter while the rest are living with their own family. Despite so, she is only living on her husband’s pension after he passed away and additional pocket money from her daughters. Between 2011 and 2015, food price inflation was 3.6% on average, whereas overall inflation was 2.4% over the same period, according to Khazanah report. In 2014, 94.6% of all households spent more on food than on any other expenditure items. Shockingly, she does not have any savings at all. Though Mrs. Cheng does not have to service any loans for property or other assets, she is living with just enough for her daily expenses with less than RM700. Sadly, she is one of the many Malaysians who is living with a similar amount of income. It’s a sad reality. “I don’t really know much about EPF or retirement savings. After all my daughters are married and have their own family, I just stay with my youngest daughter and she is the one taking care of me.” – Mrs Cheng. 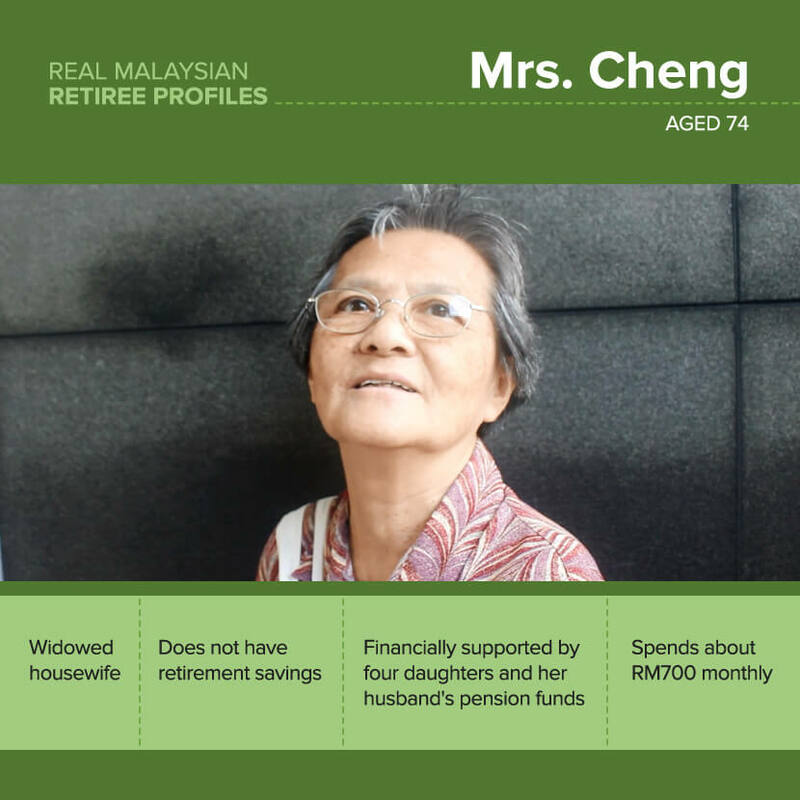 As harsh as this may sound, Mrs. Cheng may have difficulty sustaining her current living expenses if the income from both her daughters and her husband’s pension are jeopardised. With no working experience and at a tender fragile age, she could end up applying for social security assistance or public welfare housing. If you take a closer look at the latest State of Households Research report by Khazanah’s Research Institute, you will get a better picture of why there should be a sense of urgency for every Malaysian to become more financially literate with their retirement savings plan. Here’s the shocker – about one in five members nearing retirement has less than RM10,000 in savings in 2014. 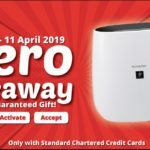 RM10,000 can probably last a person only three to four months living in the city and six months in the suburban areas. Earlier in May this year, EPF said only 22% of active contributors aged 54 have saved at least RM196,800 (considered the minimum needed) to support their retirement years, while 65% had under RM50,000, which would last them five years at the most. Khazanah’s report also shows many members are not meeting their basic savings requirements due to the fact that they either don’t earn enough or are servicing debts which leave them with very little for their expenses. About three out of four EPF members (76%) earn less than RM3,000 per month, and nearly 90% earn less than RM5,000 per month. Mrs. Cheng being one of the many relying on their children for financial support, may not realise that this creates an unintended spillover effect. If her children are spending more and not saving, her children too will be unable to save for their future retirement and it keeps going on. On top of that, many people still are not aware of their rights and responsibilities as an EPF member or other forms of retirement savings, such as the procedures to withdraw spouse’s retirement savings when he/she passed away. Without nominating your family for your EPF, no one will be able to withdraw your retirement funds including your spouse and parents when you passed away. At the end of the day, the ones who are left behind continue to suffer from the loss and financial difficulties. This impact will be harder for those belong in B40 group, especially large group of families whom only rely on one or two income sources. So it is important to factor in your loved ones by nominating your beneficiary before anything bad happens to you. This way, at least partial of your family or spouse’s finances will be protected. Nominate a beneficiary (parents, spouse or siblings) for your EPF to ensure that if in the case of death, your EPF money will be able to transfer to the nominees. You can nominate anyone with a witness by filling up Form KWSP 4 at any nearest EPF office. Get life insurance and nominate the same group of people as a beneficiary. Tell them about it. Do not solely rely on children for financial support during retirement. Get ahead and be financially independent with savings. 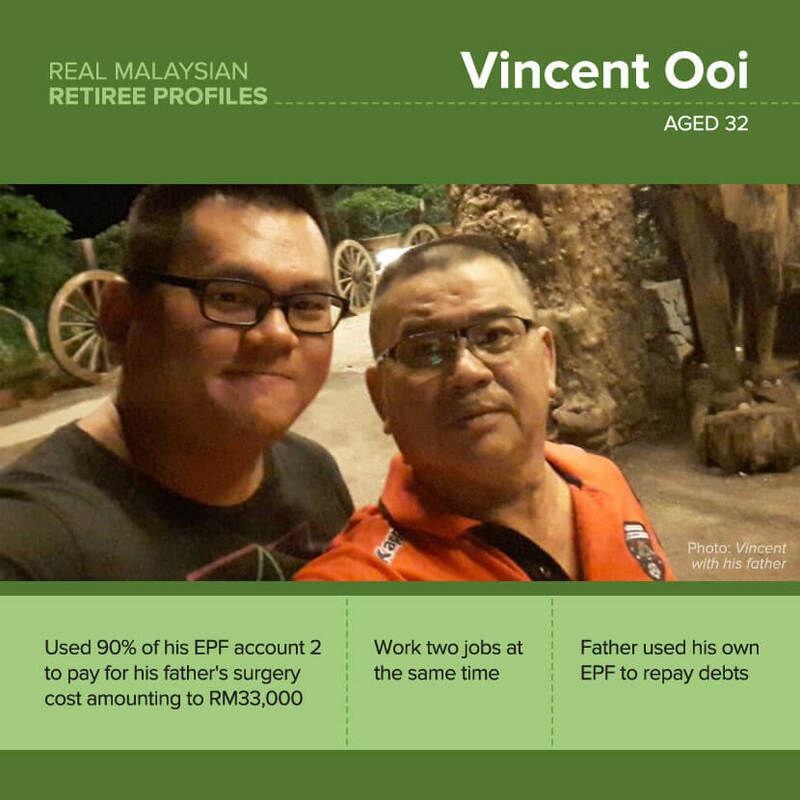 Vincent Ooi, a sales manager for a mattress company aged 32 years old (nowhere near the retirement age), said that he used 90% of his EPF Account 2 to pay for his father’s surgery (blood artery related) cost near to RM33,000. Vincent’s father had to use his EPF to service his debts that he had accumulated over the course of his working days, which left him in a vulnerable position. Fortunately, with the amount of money Vincent withdrew, he managed to cover his father’s medical cost and still has a healthy balance in his total EPF. “I am lucky to have save adequate amount of money in my EPF when my father was admitted to the hospital. However, after this incident, I need to work harder to save more and prepare myself for my retirement in the future,” – Vincent. Continuing to contribute to his existing retirement funds, Vincent is working two jobs to build a better retirement outlook for not just him, but his family as well. 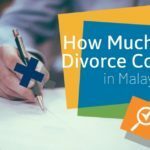 His story points out another important segment that most Malaysians have missed out in their retirement plans – medical inflations. Take note that there is only a limited number of young adults have the ability to afford such amount of medical costs in Malaysia. The majority of Malaysians go to public healthcare facilities. 75% of Malaysians seek in-patient treatment and 90% of Malaysians seek out-patient treatment at public facilities. Despite that, the government spends only 52.4% in total healthcare expenses. This translates into higher demand and costs in private hospitals. Health problems do not discriminate between age and gender including those who have been known to lead the healthiest of lifestyle. By the retirement age of 60 and above, it is also possible that certain medical insurance may not be sufficient to cover the medical costs for cancer treatment. In Malaysia, the medical inflation rate, which is the increase of medical costs, is between 10% and 15% every year. In Vincent’s case, it is good for him and the family that he managed save the day with the sufficient amount of savings in his EPF. 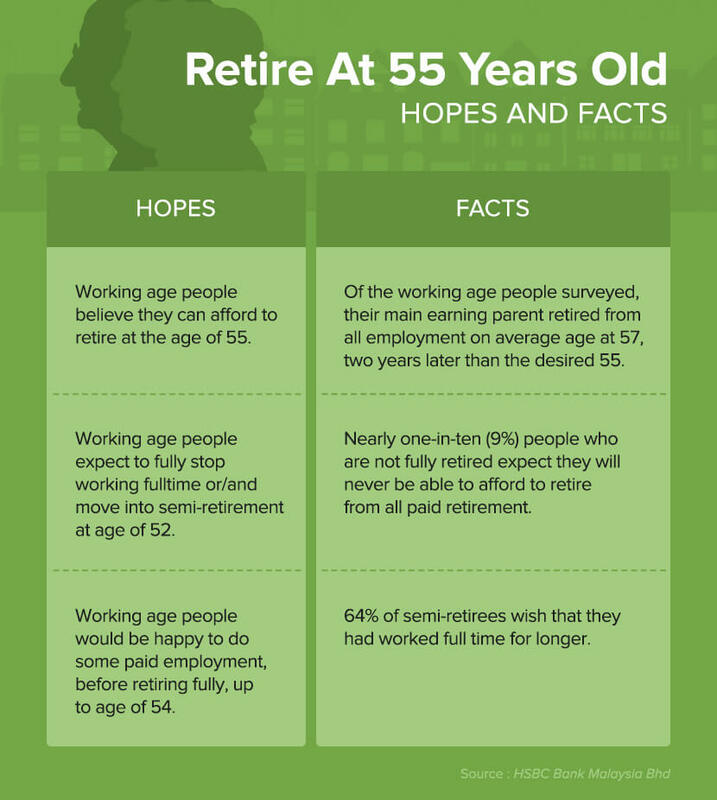 At least 64% of semi-retirees from HSBC’s survey also pointed out that they wish to have worked full-time longer to save more money to support their retirement plans, which should include medical expenses expectations. With the revised minimum retirement age to 60 years old in 2013, Khazanah Research suggested that it may be prudent to further increase the minimum retirement age to encounter the issue of insufficient savings to retire for average Malaysians. Working adults especially the entry-level should get a medical insurance to avoid an expected hit from high medical costs in the future. Guide and educate your family the correct ways to handle their retirement savings. Complaining about challenges in life is not going to solve the problem but taking action will. 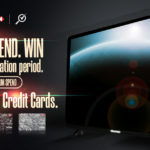 If you have more relevant information, please leave us a comment in the box below!